Ask fellow campers about "RedTail RV Park (formerly Stage Gulch RV Park)" and nearby attractions. This is an easy access park about a mile off 84. A fair number of trees, but they do need trimming. Sites are level and fairly close together, but each site has a beautiful lawn separating each site. No picnic tables, but we normally don't use one, so no big deal to us. It does back to a secondary road so there was some road noise, but not objectionable. The park has been sold and the new name is RedTail RV Park and Storage, however the signage still show the original name. Go to https://www.redtailrvpark.com/ for more info. We camped at RedTail RV Park (formerly Stage Gulch RV Park) in a Motorhome. RV park is off 84, very clean and an easy place to relax. They have cable and internet. Manager was a delight to get us set up . If you want food, it's not far. We camped at RedTail RV Park (formerly Stage Gulch RV Park) in a Motorhome. 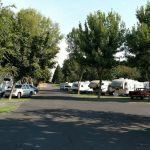 Very clean, well kept RV park. Manager was very nice and helpful. Would recommend to others. We camped at RedTail RV Park (formerly Stage Gulch RV Park) in a Fifth Wheel. This is a small tight park off of US 395. There was only 2 spaces left in the park when we stayed and the sites are small and tight. The park is attended by one of the tenants. We did not have any problems. We used their laundry room and it was fine. I would use this park again but not for a long term stay of more than a week. The prices were good at $24.00 per night. We camped at RedTail RV Park (formerly Stage Gulch RV Park) in a Motorhome. This is a very well kept park. The sites are level and shaded. There are many resident units in there but not a problem as all are well kept. This is the best choice in this town as the other is in a truck stop parking lot. My only negatives on this park are noise from the highway, a train that goes by on occasion, and no wi-fi. It is a good overnight stop if you are in the area and need a decent place to stay. It also has a nice laundry. We camped at RedTail RV Park (formerly Stage Gulch RV Park) in a Motorhome. Are you affiliated with RedTail RV Park (formerly Stage Gulch RV Park) ?